As soon as Steve Bowser could throw his leg over a motorcycle, he was gone. The feeling of freedom was what gravitated him towards riding. This has been a major theme in Steve’s life, personally and professionally. Steve joined Kinney Group’s growing Splunk Program in November of 2015. He has since experienced a different type of freedom – the freedom to create. Each new customer is an opportunity to develop a creative solution for complex business problems in the data center. Knowing how much Steve loves his Indian Roadmaster (which is incalculable) helps uncover what motivates him. The other major factor is how his love for technology flourished. Eyes glued to the television, Steve fell into the final frontier aboard the starship Enterprise. The possibility of technology was endless and fascinating to four-year-old Steve and the time he spent watching Star Trek compounded his interest in computers. It was not until about ten years later, on a field trip to see the World’s Fair Exhibit at the Toronto Science Center, when he had his first encounter with a computer. It is incredibly impactful to have someone in a role that directly aligns with their passions. They motivate the team, unlock crazy potential, and drive engagement within the company. Steve has found his home at Kinney Group as a Splunk Development Engineer. It combines the freedom, innovative nature, and problem-solving skills that inspire Steve to reach his full potential. Following Captain Kirk for several years, Steve worked tirelessly to land a job in the Information Technology field. He started with obtaining his Associates in Specialized Business from the ICM School of Business in Pittsburgh. Following his time at ICM, he attended Point Park University and earned a second degree in Business with a focus in IT. His journey had officially begun. Steve’s first job out of college was as a Computer Operator at a financial institute. He was putting in long days and working his way up. His grit and perseverance landed him at Cellular One (soon to be AT&T). On his first day, he was given a book of graphing paper and a one-million-dollar budget followed by instructions to blueprint a computer room. No pressure, right? This substantial initiative confirmed he was on the right career path. Steve completed this monumental task under budget and the infrastructure that he designed was in place for 12 years before the company’s expansion required an update. His early experience in an industry that he had been working towards since he was young was undoubtedly immersive. Steve was accustomed to 12 hour days and working on technologies that were completely new to him. He had the opportunity to work his way up to a Systems Administrator, ensuring reliable operation of Cellular One’s computer systems. He was also assigned to tackling database administration tasks which chartered him with the creation, maintenance, querying, backups, and user rights assignments. Steve chopped his way through the long hours, difficult assignments, mastered new technologies and now looks back on his early roles in IT as key contributors to his future engineering successes. Steve has tallied up many other wins prior to joining Kinney Group and continues to be called out for his customer centric approach to engagements and his innovative attitude towards identifying creative and efficient solutions. After gaining invaluable experience at Cellular One he moved on to a company in Pittsburgh within cable television. Steve spent his time implementing program libraries that include the History channel, Black Entertainment, and A&E. This was about the time our motorcyclist took a career detour into project management. 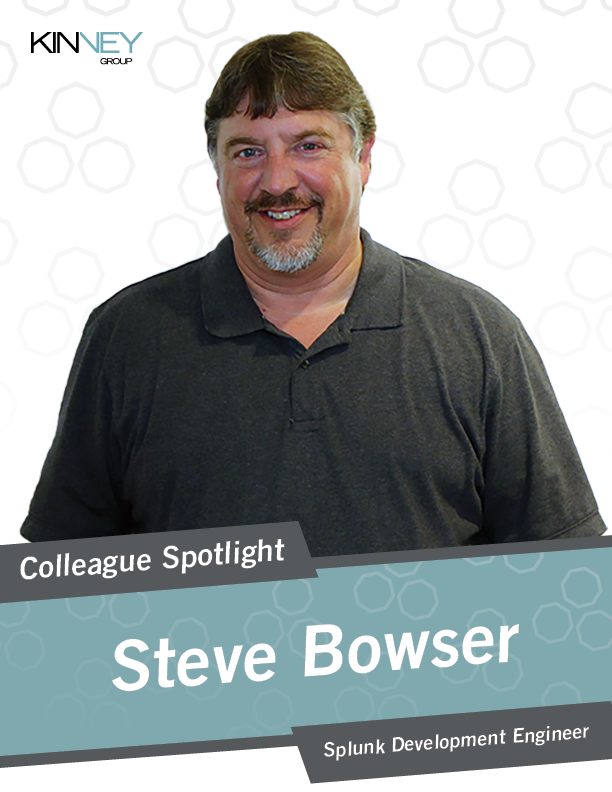 Managing projects and programs continued to give Steve the ability to be inventive and gave him a diverse set of skills that not all engineers possess. This unique perspective as a technical resource allows him to additionally focus on timely execution and instinctively map his solutions back to solving the customer’s business problem, not just the technical matter. Steve continued on a project management path and spent some time working with the Federal Bureau of Investigation. At the FBI, Steve worked on a biometrics program and other classified initiatives…that’s about all we say about that! Eventually, he started getting the IT itch again. Cue Kinney Group. Steve’s background, aptitude, attitude, and unrelenting work ethic made the decision to bring him on board too easy. He was ready to get back into the weeds and move away from project management and we had a unique opportunity for him to do so. Steve took a risk changing roles and learning an entirely new technology with the intention of becoming a platform expert in a short amount of time. Today, he is a mentor and leader within the Kinney Group Splunk program. He reflects back to his first solo engagement and can easily recall the nerves that clouded his mind the week prior. One of our tenured Splunk Ninjas, Laura Vetter, reached out before his engagement reminding him that it is okay to fail and the team was behind him for support. After that call, he knew he had found the right fit. Looking ahead, Steve sees the growth of Kinney Group’s ITOA practice continuing to flourish. Naturally, there will be growing pains and changes as we achieve our aggressive program and company goals. Steve believes our laser focus on maintaining our values, company culture, and the growth of the tremendous team we have today will make us unstoppable, so we will make it so. Where is your favorite place to visit in Indianapolis? Buca De Beppos. What is your spirit animal and why? A red tail hawk, it soars and it is free. Describe Kinney Group’s culture in three words. Fast-paced, intense, driven. Want to work at Kinney Group? Check out our careers page to see job postings. Zach Vasseur is a Talent Acquisition Partner at Kinney Group. This energetic professional has gained valuable experience in the world of recruiting.